Hong Kong: The sea of red that’s engulfing Asian stocks is enough to sap hopes even from the most optimistic traders. 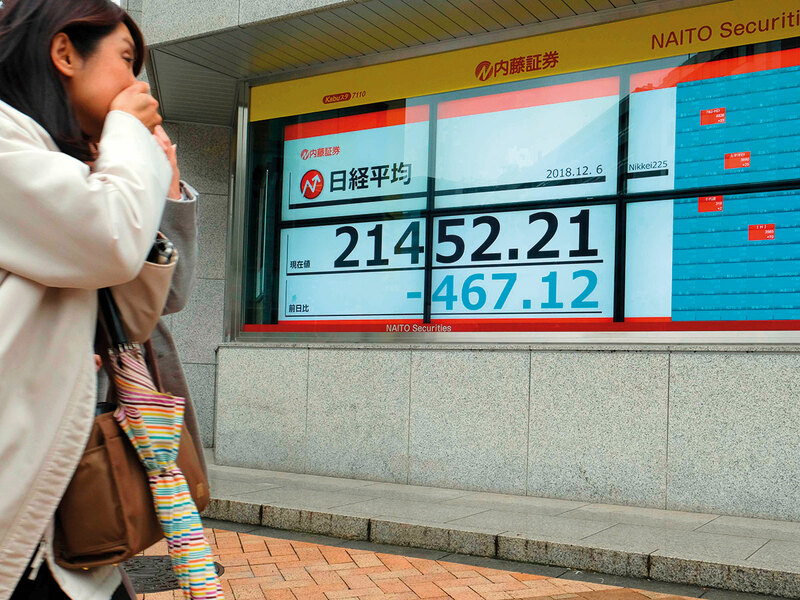 The regional gauge fell 1.8 per cent for its biggest daily plunge in six weeks as markets from Tokyo to Hong Kong and Mumbai sank. In just three days, the rally seen last week in anticipation of Presidents Donald Trump and Xi Jinping’s trade discussions has more than vanished, with Asian equity values taking their losses from a January high to $6.2 trillion (Dh22.7 million). On Thursday, it was the ripple effects of the arrest of Huawei Technologies Co.’s chief financial officer that hit the market. Wanzhou Meng — also the deputy chairwoman and daughter of the company’s founder — was arrested in Canada over potential violations of US sanctions on Iran, provoking outrage from China and spooking Asian traders. Losses in Hong Kong’s Hang Seng Index reached 3 per cent at one point, more than anywhere else in the region. In addition to the Huawei hit, business groups in the city are starting to worry the Trump administration will open the door to ending the financial hub’s preferential trade status, rendering it “just another Chinese city” as its government gets closer to Beijing. It didn’t help that US equity-index futures sank on Thursday, with contracts on the S&P 500 Index plunging as much as 1.9 per cent from Tuesday’s (December 4) close. And with Opec+ failing to agree on details of oil-production cuts, energy shares in Asia got another hit. As a result, investors have turned to haven assets: the yen strengthened, knocking down Japan’s Topix index by as much as 2.5 per cent and sending it to a five-week low. And the cautious calls have accumulated recently. For Asian shares, time is running out to recover the 13 per cent slide the MSCI Asia Pacific Index racked up in 2018, putting it on track for its worst year since 2011. And once again, the regional benchmark failed to hold above its 50-day moving average. With uncertainties over trade talks and growing worries about the global economic growth, hopes for a strong recovery are dimming.